I had a bunch of photos in a multi-picture wall frame that had been sitting on my bedroom floor for a year (!) collecting dust since I hadn’t figured out a good place to hang it. The only empty wall space I have is too big for the little multi-frame. I needed something larger to take up the space. I decided to create my own picture frame/ art piece that way I’d be killing two birds with one stone. I found this idea on Pinterest. Like most Pinterest projects, my photo wall display didn’t turn out as well as I’d hoped, nonetheless, it still looks good enough to hang. It serves it’s purpose well. 1. Went to Hobby Lobby and spent way too much money. 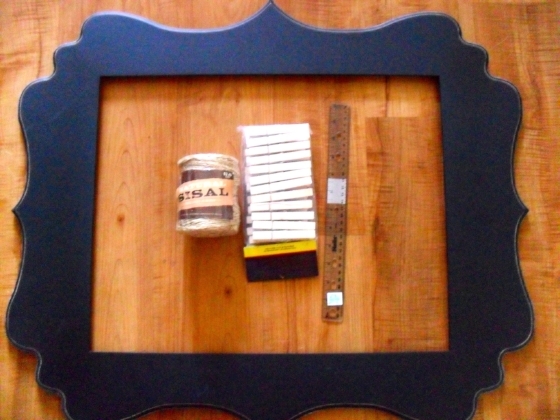 The frame was really the most expensive thing, but I bought some other tools for another craft project. When I got to the register I was quite surprised how quickly it all added up, but don’t let that deter you! This was a pretty inexpensive craft. Picture frame. I got one without glass, but that’s just because the frame worked perfectly with my decor. If you find one with glass, just discard it. You won’t be needing it. Burlap yarn. You can use wire, but I wanted more of a rustic look. 2. I equally measured on the inside of the frame where each hook would good. Make sure you keep in mind how far down the pictures will hang. You don’t want them overlapping each other. 3. I slipped the burlap yarn through the hooks and secured with a knot. 4. Flip the frame around and hang your favorite photos on the yarn by a clothespin! 5. You’re all done! All and all, this was a pretty simple project that won’t take you too long to make. Did you make anything this weekend?